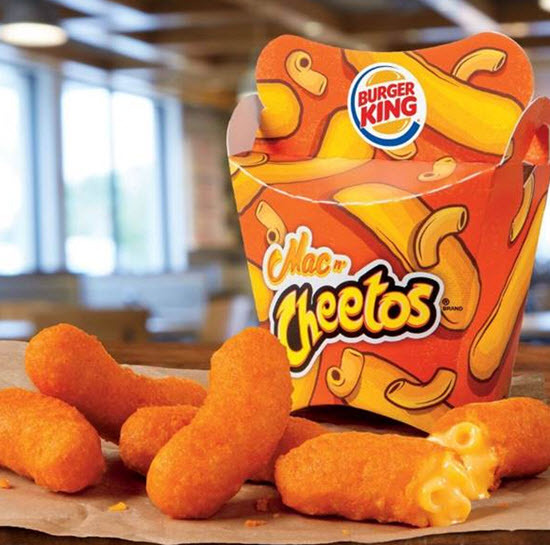 Burger King has launched a new menu item called Mac n' Cheetos. The fast food mashup combines Cheetos with the comfort favorite macaroni and cheese. It puts mac and cheese inside of a fried Cheeto-flavored shell. In a way it is also a twist on Mozzarella sticks. Mac n'Cheetos come in a box of five for $2.49. The calorie count for all five is 310 calories. This calorie count does not include the Ranch dip that comes with Mac n'Cheetos. Burger King says the new item will be available a limited time item available at participating locations. The national roll-out date is June 27. Today says the new item is already a hit for Burger King. They note that Taco Bell's Doritos-based Locos Tacos hit generated a staggering $1 billion in sales within a year. Mac n'Cheetos has a lot of buzz and a lot of people will try them. Burger King will have to sell a ton of them to generate $1 billion in revenues.